In 1771, Joseph Cugnot built the first automobile powered by a steam engine. This car, which peaked at 3.5 km / h, was used among other things to transport weapons. Over the years, thanks to the contribution of several designers, car models have slowly evolved. So, it took more than a century between the design of the first car and the debut of the first commercial trucks used for industrial transportation. More precisely, it was not until 1898 that the first truck was started by Gottlieb Daimler. In Quebec, trucking, which is one of the largest industries in our economy, began modestly around 1915. 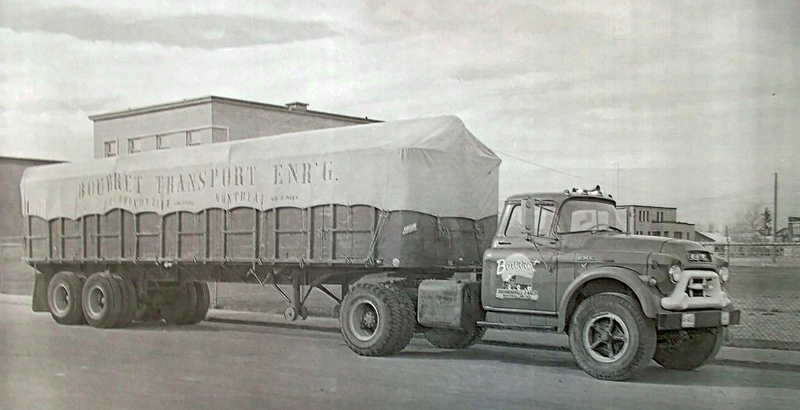 Like Transport Bourret, the majority of businesses started with one truck. However, from year to year, fleets of vehicles have become more important. Thus, the precursors of road transportation are those who have made the field evolve through investments placed in the industry. These investments have resulted in equipment upgrades, better working conditions and higher wages. Nevertheless, we must not neglect the human aspect of this great success. Indeed, for the trucking industry, most of the success stems from the men who are committed to its evolution. Men like Ludger Bourret who invested their assets in humble beginnings. Men who did not hesitate to sit behind the wheel, who used their knowledge and skills to invest in a future they considered promising. After more than a century of existence, road transportation is inked in our manners. Moreover, it is undeniable that the evolution of the transportation industry is essential for the development of our economy.